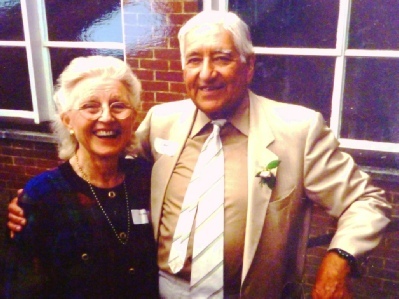 John and his wife Irene (as pictured) are due to compete in the Blackpool Dance Festival at Blackpool's Winter Gardens. 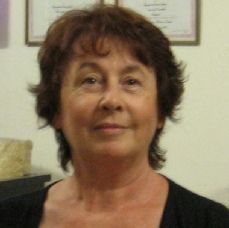 They are competing in the Senior Latin Championship on 30 May 2011. According to the website, they will be dancing the cha-cha-cha, rumba and jive. We wish them every success in the competition. Early feedback suggests the pair were highly commended. John has forwarded some photographs of the competition which will be posted here shortly. He also sent a video clip which will also be posted here in due course. And do visit his update on our Where are they now? page. “There I was thinking it would be a somewhat subdued night out with a couple of old school pals but no, it turned out to be a rather eventful evening. Arriving at the Hop Blossom pre-gig with Julian Walden and having ordered an initial round of Fuller’s ESB and wine, I bowled over to where Geoff Whiting was seated only to be told rather brusquely I thought, sorry he couldn’t chat as he was in a meeting! 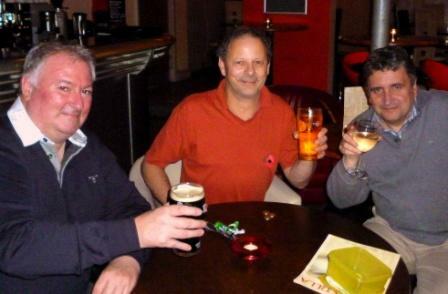 John Saunders, Mike Mehta and Julian Walden, La Castilla, 7 November 2011. John Saunders was already ensconced in the adjacent back room with a drink and by default I settled down on an over-size sofa. Now I confess that on one previous notable occasion, several of us had got rather too relaxed, courtesy of the fine ales at the Hop Blossom and consequently had completely failed to make it to the comedy gig down the road, but I had given an assurance to Geoff that this would not happen again. Geoff’s meeting ended and Geoff and Andy Perry disappeared to the loos. Thinking that this was my opportunity to catch them, before they moved on to the comedy venue, Geoff reminded me that I should aim to be at La Castilla for 8.30pm, as they were low on numbers and desperate to get people down there early. At this point in the evening, the main problems seemed to me were A) I wasn’t totally convinced of the need to be really early and B) the ESB 5.5% was now beginning to make itself felt and I duly told Geoff I intended to be at the venue by 9pm but no earlier. Having acquired another pint of ESB, I then settled back into the now all-too comfortable sofa. Some seven minutes later, Geoff marched in and insisted we get ourselves along to the venue pronto. Apparently he had already tried ‘phoning me on my old work mobile number and spoken to someone at the council! Having got nowhere fast (no surprise there!) he had decided to walk back to the Hop Blossom to round us up. Quickly finishing our drinks (or not, in John’s case), we all relocated to the comedy venue. Faced with the sadly disappointing selection of drinks at this tapas bar and in hindsight, misguidedly opting for a switch from beer to cider (neglecting the rule to never mix one’s drinks! ), Geoff then insisted we sit at the table immediately in front of the stage. It is at this point I should have realised that this was not a good idea. Within a few minutes of the first turn coming on, it quickly became apparent that mixing drinks had not been an especially wise decision. The first act was on and I was already having trouble focussing and when the time came for some audience participation, it was unfortunate that the comedian thought that I would be the appropriate member of the audience on which to try out some convoluted magic trick involving joining together several rubber bands. One of the bands promptly shot off in the direction of the three single girls on the other side of the room who were largely unimpressed and effectively scotched any chance we would have had of making a move on them (sorry, John!). The comic returned to the stage and asked me if I knew the time. I said I had no watch. 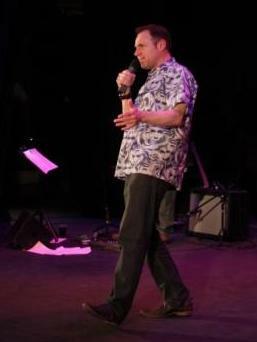 Est voila, he then held my wristwatch aloft on stage. Now, given my rapidly deteriorating state of consciousness, I wasn’t greatly surprise he had managed to relieve me of my watch but as I was sandwiched between Julian and John who were sitting all of two feet from me, I might have reasonably expected one of them to have noticed. After this debacle, the comic tried out some comedic mind reading tricks, first asking John Saunders to think of an animal which he would then draw. John had in fact thought of a donkey and in Julian’s case a zebra, which probably tells us a great deal about John and Julian’s thought processes but in both cases the end drawing bore no resemblance to the animals which had been thought up. The audience was only 13 strong and you didn’t need to be a genius to work out that there was a strong probability that we would continue to be picked on as the evening progressed and sure enough, we were. I reached the point where I simply said ‘no’ to the various questions including on the theme of unrequited love. Given the seriously small size of the audience and the fact that the headline act on his way from Glasgow had decided to turn around and head back in the direction of Northumberland, Geoff Whiting MC for the night, did a fine job of introducing the acts, and linking with smooth patter ‘do drink as much as you can, it will seem funnier’ and indeed we did and it did. Roll on the next comedy evening! 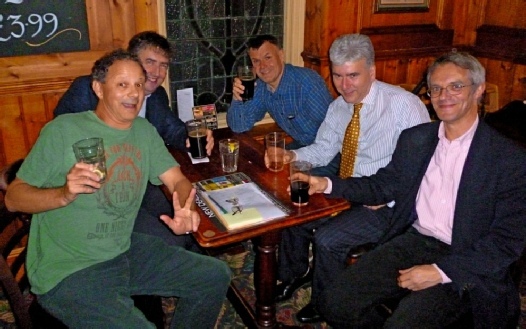 A "mini-reunion" was arranged in the "Coronation", Surbiton, on 6 October, featuring a reasonable number of our good selves. Caught celebrating the occasion are (left to right) Mike Mehta, Dr Chris Wright, Mark Bravery, Kevin Desmond and John Clarke. A special celebration to mark 110 years since the founding of the Farnham Girls Grammar School took place at the old school (now South Farnham School) in Menin Way on the afternoon of Saturday 24 September 2011. Participants included John McLaughlin, Jill Goddard, Jean Parratt, Jean Blair, Carol McMahon, Georgina Crawley, Helen Kennedy (Collett), Alison Schofield and Rev John Innes. Our special roving reporter Mike Mehta has sent us feedback on the proceedings. Click here to read his full report, which includes a number of additional photos. As previously reported, a public enquiry was held in St Thomas' Church, Frensham Road, on 20-22 September 2011. The enquiry investigated an alleged public right of way across the College grounds. The alleged route runs from Morley Road, across the College grounds and down the track behind the old cricket pavilion and into Alfred Road. The applicants case was led by Valerie Steel (widow of Duncan Steel) and her daughter Helen. The alleged public right of way was opposed by the landowners (Guildford College and the Farnham Education Foundation [ie the Trustees]). However the Inspector was unable to complete the enquiry within the 3 days allocated and so the hearing has been adjourned until 16 November 2011 when closing remarks will be presented by both parties. The Inspector's final verdict is unlikely to be delivered until the new year. [Successful outcome reported in 2012; further details of the decision regarding the alleged Right of Way can be read here (pdf document). Somewhat belatedly we are delighted to report that Martin Collier was elected Mayor of St Ives in May 2011. He is pictured here in his Mayorial car. According to the local newspaper reporting his election, Martin "knows he has a tough year ahead but insists party politics are not the way to go." Martin was "one of a tide of independents elected to St Ives Town Council in the wake of the Corn Exchange controversy in 2008". The 51-year-old barrister has enjoyed his stint on the authority so far but admits dealing with the limited powers of parish councils has been frustrating. 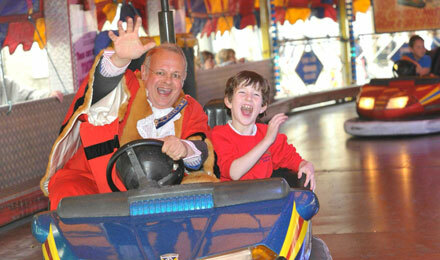 However, in his new role as mayor, Cllr Collier, who lives in West Street, is keen to make a difference. “We have got to be alive to how we can respond to savings,” he said. “We have taken over the public toilets at the bus station. We have got to anticipate how Huntingdonshire District Council and Cambridgeshire County Council will make savings, and see how we can help plug those gaps." You can read the full report here. We regret to report the death of Jane Walters, who died on 29 April 2011, aged 66, from bowel cancer. 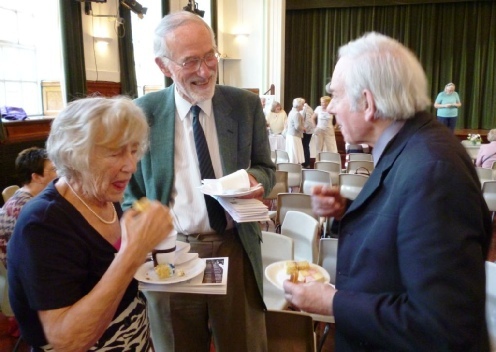 A service celebrating her life was held on Friday 13 May at St Mary Magdalen, Ripley. Most of us will remember Jane who was head of drama at Farnham College before she moved on to Godalming College. She also taught at Winston Churchill School, Woking; the Woking Youth Drama Workshop; and at the Yvonne Arnaud Theatre in Guildford. Jane's obituary in the Surrey Advertiser paid tribute to this "inspirational drama teacher" who taught and directed hundreds of children and young people in Surrey. Even as her illness worsened she was helping neighbours and continued to support youth drama. You can read Jane's obituary here. We also regret to report the death of Valerie Blanks on 20 May 2011. She is seen here with "Nick" (Donald Nicholson) at the "Year of 1979" Reunion at Farnham College. The Bell Tower of the Old Building was dismantled as unsafe last year. 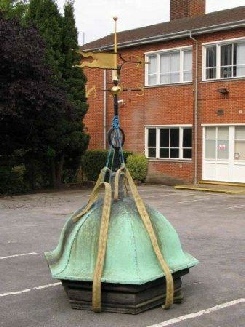 Our photo shows the cupola of the clock tower in the College car park shortly after its removal from the roof. Since its restoration has no particularly crucial role in the functioning of Farnham College some sort of special appeal fund is likely to be established by the 400 Trust in association with the Old Farnhamians Association. Monies raised would be used to help finance any restoration works. Prime Suspect R.I.P. Long live Strange Arrangement!! 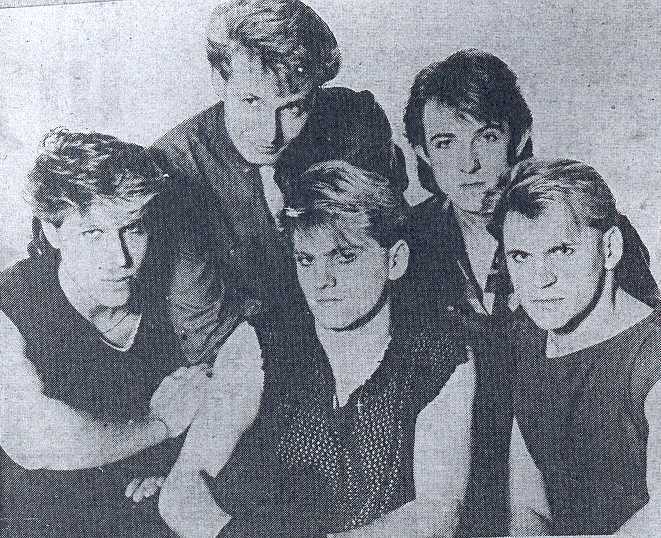 Yes 'Strange Arrangement' , Geoff Whiting's hit-making band from the 80's (well, the band) is BACK! A gig took place on 19 May 2011 at the Boiler Room, Guildford. Our roving reporter, Mike Mehta went along. You really had to be there to appreciate the gig. Surreal yes, nostalgic certainly. Geoff was front man and mixed music with comedy, which came in very handy when the timing was lost during the rendition of 'Winston'. This was a shame, as Geoff had spent several minutes informing the small crowd that this was a song penned by himself before 1984 and dealing with the principal character from Orwell's novel of the same name. He then explained at some length that it was largely allegorical in nature, etc etc, at which point one of the exasperated audience shouted out 'Get on with it, Geoff'. There is a splendid video clip of Strange Arrangement's Into the Light on YouTube with some brilliant vintage photos etc. You can also see highlights from their Reunion Concert at the Boiler Room. In October, Strange Arrangement also played a gig in Guernsey supporting the band Fade2Grey. You can read a review of this gig here.